It’s no secret that cancer treatment takes an emotional and physical toll on patients, and leaves cancer survivors dealing with some long-term side effects. According to the American Cancer Society, the goals of cancer treatment include shrinking cancerous tumors to make them easier to remove surgically, killing cancer cells in the body, and/or controlling cancer so it does not grow and spread. Chemotherapy, steroid medications, and hormonal therapies used to achieve these goals sometimes have unwelcome side effects, such as accelerated bone loss, potentially leading to osteopenia and/or osteoporosis. Getting regular exercise and maintaining a healthy weight are especially important if you already have osteoporosis. Regular exercise triggers the body to create new bone cells; being underweight can contribute to bone loss. Additionally, make sure to take steps to reduce your risk of tripping and falling: Wear shoes that fit well, declutter your living space, have your vision checked regularly and wear corrective lenses if needed, and consider exercises to improve your balance. Osteoporosis is a disease that develops over time and cannot be seen or felt. 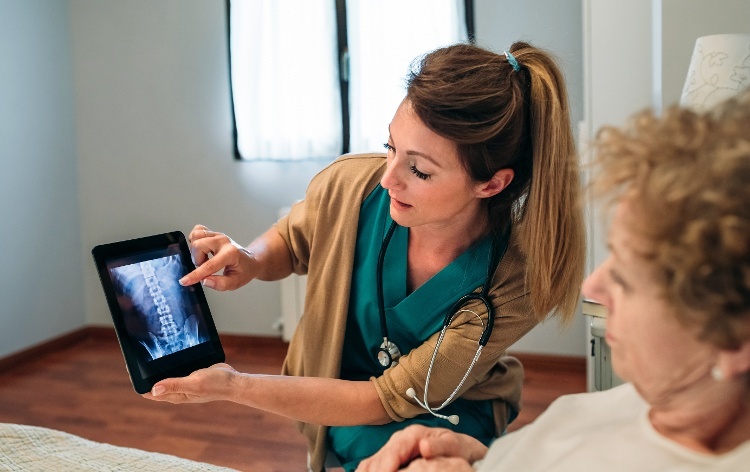 Knowing that you are at increased risk of developing bone problems, talk to your doctor about whether you should have periodic bone mineral density tests. This quick, easy test measures the thickness of your bones and can determine if you have normal bones mass, low bone mass (Osteopenia), or osteoporosis.